Overall Thoughts: The energy creation on this card is a great addition to an otherwise mediocre card. 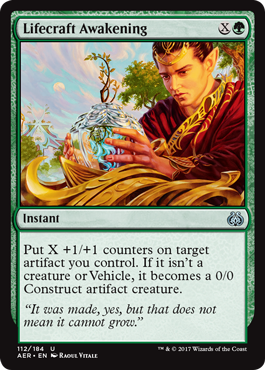 A 3/3 for 4 mana is less than desirable, but Green has many ways to utilize the energy this card brings with it. 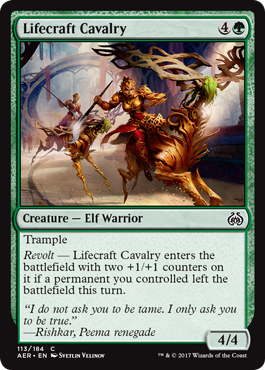 Overall Thoughts: Trample is a great ability on creatures large enough for it to matter. 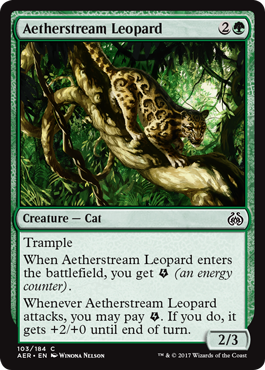 Even though this leopard can boost its power one time on its own, I don’t expect to see this card outside of the most dedicated energy decks (and possibly not even there). Overall Thoughts: While 7 mana is quite pricey, this card has the potential to gain you a huge amount of energy when it enters the battlefield and each turn it attacks. 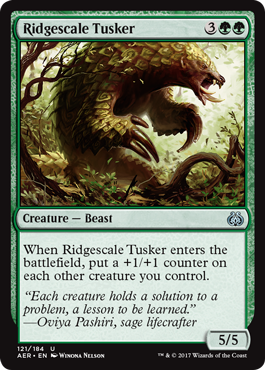 This looks like a lot of fun in a deck alongside Longtusk Cub, Architect of the Untamed, and Bristling Hydra. Overall Thoughts: A 5 mana enchantment that possibly does nothing sounds terrible. The fact that this has the potential to do broken things is the only reason this card could see play. Just keep in mind that this card doesn’t cast the card, it just puts it into play, so you don’t get any abilities that happen when a card is cast. Overall Thoughts: He, look. It’s the new Llanowar Elves. I’m not happy that we no longer get a 1 drop mana dork, but I’ll take what I can get. At least this cards toughness should help gum up the ground if I don’t need to tap it for mana. 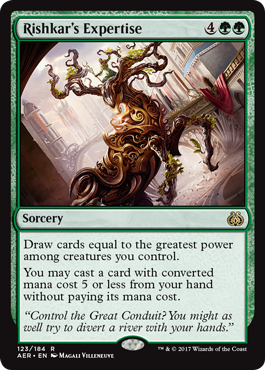 Overall Thoughts: Since this card is part of a combo with Servant of the Conduit, I’m sure this will see some play. It also has the potential to be a good creature for little investment. This is a good card. 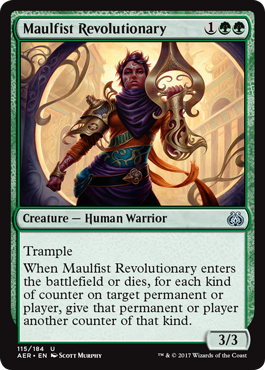 Overall Thoughts: This is a card that definitely needs the bonus from Revolt in order to be playable. 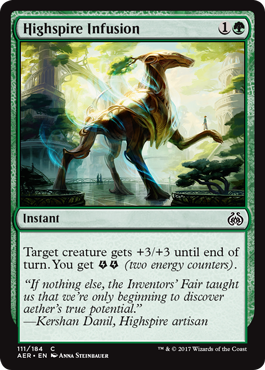 Without the bonus, this card is not good, but there are lots of cards that have an effect if you have a creature with +1/+1 counters on it, and those cards are great with this card. Overall Thoughts: I like this card a lot. 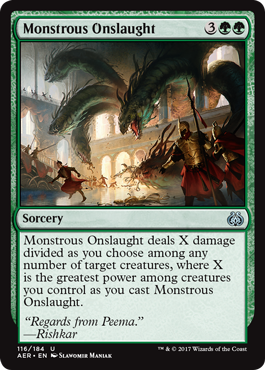 It’s great protection for your entire team from most everything, just beware of effects that grant -X/-X to your creatures, because this will have no effect on those unless they target one creature. It’s nice to have an answer to Fumigate. 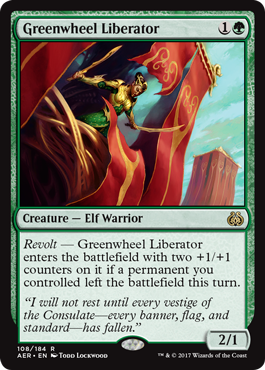 Overall Thoughts: While this card helps accelerate your mana when you can trigger the Revolt ability, the fact that it’s not free to use makes this card less than stellar. It also has passable stats, but is nothing to write home about. I don’t expect this will see much play in Standard. Overall Thoughts: This card gives a nice bonus for 2 mana, and the energy is a nice bonus. It is just a combat trick, though, so it won’t go into every deck. Overall Thoughts: I’m not a huge fan of this card. 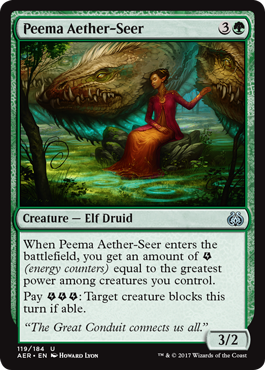 The nice part is the X in the mana cost, so it can make whatever size of creature you want to make. The bad part is needing to have an artifact in play to use this card. Overall Thoughts: Here’s another card that greatly benefits from the Revolt ability. Without triggering it, this card is good, but not great. With it being triggered, you get a 6/6 with trample for 5 mana, which is amazing. Overall Thoughts: I have a soft spot for +1/+1 counters. I’ll admit it. 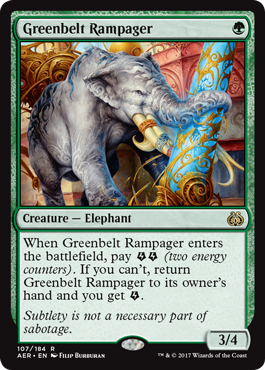 I love the thought of playing this card the turn after playing a Verdurous Gearhulk and getting 6 additional +1/+1 counters (assuming I have 6 creatures in play). I know, it’s a dream that likely will never happen, but even getting 3 to 4 +1/+1 counters would be good. Overall Thoughts: A 3/3 for 3 with trample is good (even if the mana to cast it is restrictive). The enter the battlefield and death abilith is also good, if you can utilize it. This card has potential in the right deck. 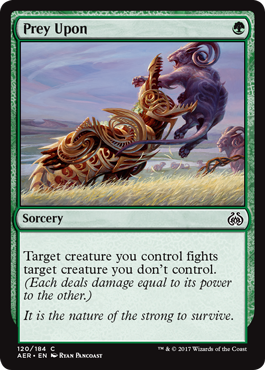 Overall Thoughts: This card could be good removal for Green if it didn’t have such a high cost. And I don’t just mean the mana needed to cast it. Since it also requires a creature with a high power to be in play, this card could be either awesome or meh depending on when you cast it. Overall Thoughts: A 1/2 with Deathtouch for 1 mana is a great deterrent for your opponents attacks. The fact that it can get bigger with the Revolt ability is nice, but not needed. This card has a good chance of being played in many decks. Overall Thoughts: This card is good at what it does, but what it does isn’t good. 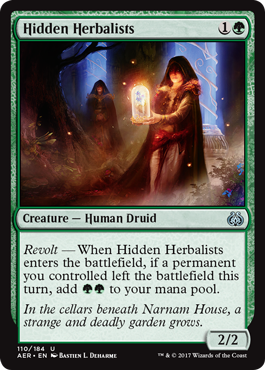 The nice thing is that it can target one of your own artifacts which can counter your opponent’s removal and trigger Revolt for you. 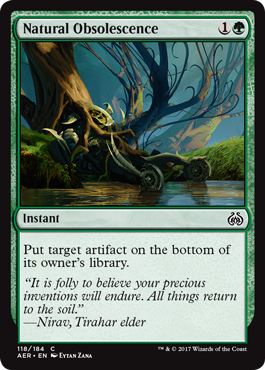 But generally if I’m going to target one of my opponents artifacts, I’d rather get rid of it for good rather than putting it back into their library for them to search for. 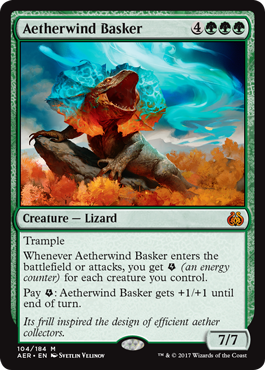 Overall Thoughts: Making it so that your opponent has to block with a particularly annoying creature can be nice. The downfall is that you will need a creature to attack with that can kill whatever you make them block with. And for the trick to work, you really have to limit the creatures you attack with to the ones that can kill that targeted blocking creature. It’s a trick that can work, but requires a lot of setup. 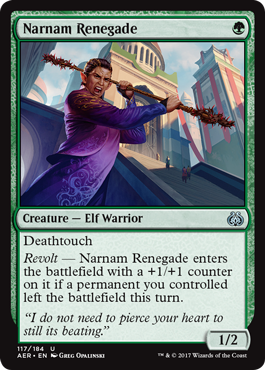 Overall Thoughts: This is good for a Green removal spell, but not amazing. Since it only costs 1 mana, you will likely be able to play other cards that give you a bonus that will ensure you kill whatever creature yours is attacking. Overall Thoughts: This is a nice late-game threat that helps pump your entire team. When paired with blink effects, this becomes a must counter / destroy creature. I think this will see some play in a deck poised to utilize +1/+1 counters to maximum effect. 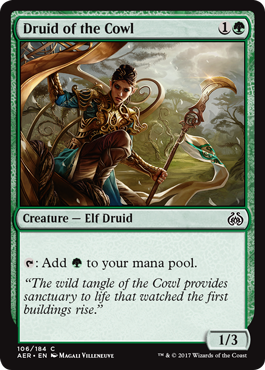 Overall Thoughts: Green certainly has a way of putting +1/+1 counters on your creatures, doesn’t it. Add this guy into the mix and suddenly your whole team can tap for mana, which in turn will help to pump up your team. I’m a big fan of this card. Overall Thoughts: The fact that this card costs 6 mana definitely hurts its playability, but I still think it’ll be a big contender in decks that ramp your mana. And with all of the +1/+1 counters floating around, it won’t be hard to draw 4 or more cards when this card is played. 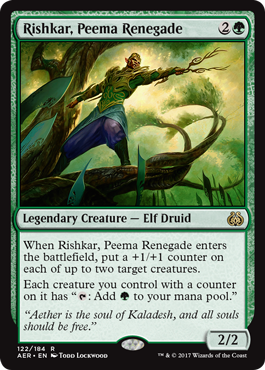 While it won’t be in every deck due to its mana cost, this card will likely see some play in Standard. 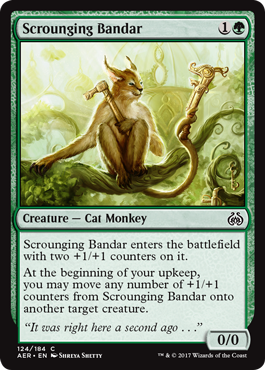 Overall Thoughts: Here’s a cat monkey with some upside. 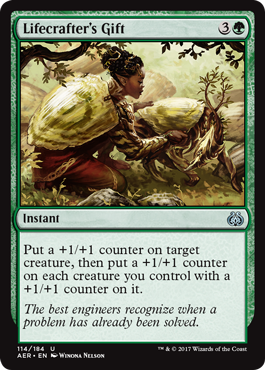 Being able to move the +1/+1 counters from this card to any other creature is nice, but it comes with the drawback of only being able to do it on your upkeep. If you know your opponent has a removal spell, this card could end up sitting in your hand for a while before it’s safely cast. But I’d rather cast it anyway and make my opponent choose to remove it if they want. Also, keep in mind that if this card has more counters on it than just the original two you get when it’s cast, you can transfer those too. Overall Thoughts: This card is a little small to be an effective blocker with Reach. 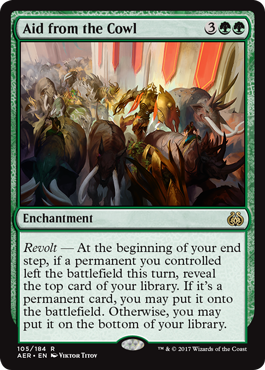 The main reason to play this is for the potential card draw that it allows when the Revolt ability is triggered. 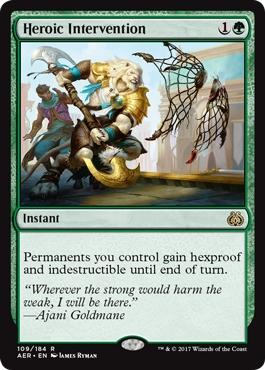 Once that happens, feel free to chump block whatever flying threat your opponent has. Overall Thoughts: This card can fix your mana for very little cost. 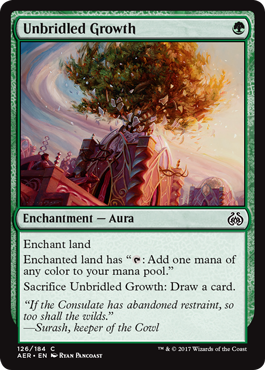 And if it or the land it’s enchanting gets targeted by removal, you can sacrifice it to draw a card, so the only risk in playing this is loss of tempo. 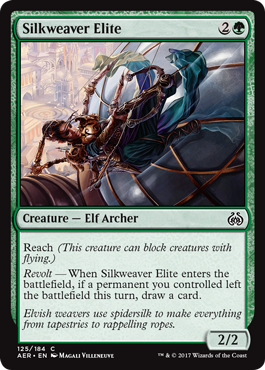 And that’s a look at all of the Green cards in Aether Revolt. Most of them are fairly mediocre, but there’s a couple that I think are worthwhile. What do you think? Did I give high marks to any card you think is trash, or did I underevaluate any cards? Let me know by leaving a comment below. 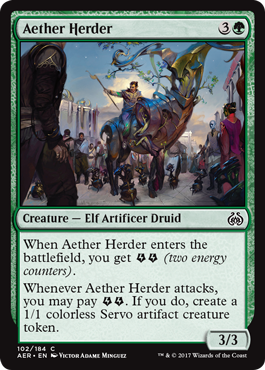 And be sure to join me tomorrow for the final installment of my reviews of the cards in Aether Revolt when we take a look at the multicolored cards, artifacts, and lands. I’ll see you then. Aether Revolt, Card Review, magic the gathering, Mike Likes, MTG, Set Review, Standard. Bookmark.